The car has an extensive well documented race history in IMSA Camel GT ‘O’ class from 1981 until 1985, including several appearances in world class events such as the Daytona 24-Hours and the Sebring 12-Hours and somewhat surprisingly for a car with such a race history, no major accidents. Recently discovered still in the ownership of Ron Coupland, where it has remained untouched but carefully stored for more than thirty years, along with the original support equipment including refuelling rig, complete spare gearbox, ratios and bodywork all in the exact condition as the car last appeared in Daytona 1985 – A unique, completely original and undisturbed time capsule of early 80’s IMSA GT competition. Porsche could not have wished for a more sensational start to the racing success of its 911 RSR. Peter Gregg and Hurley Haywood won the Daytona 24-Hours, the first race of the 1973 season, outright. Their Carrara RSR running as a prototype since homologation had not yet been secured. The car would become a perfect choice for customers who could rely on upwards of 300 bhp from its 2.8 litre capacity and near bullet-proof reliability. Gregg and Haywood followed up their Daytona win with victory in the Sebring 12-hours and the Porsche RSR’s legend had begun would remain competitive over many seasons. 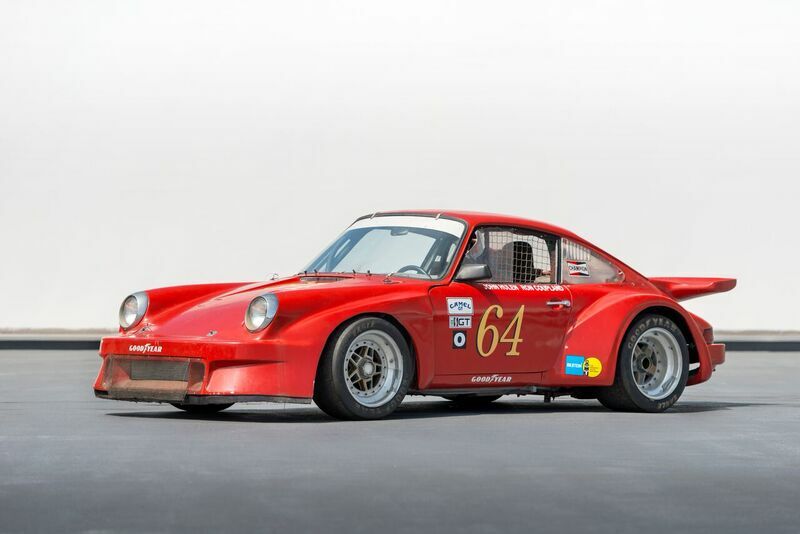 Originally a S.C.C.A race car in the late 60’s, it was re-built to full RSR specifications in the mid 1970’s by Bob Gregg, a legend in United States motor sport history, who not only had a great reputation as a driver but also as a team owner, entrant and engineer, this car has a truly amazing and well documented history. Known as “Bullet Bob the Barefoot Boy” because he didn’t like racing with shoes on, Bob Gregg’s career spanned six decades, winning over 1000 main events and forty-eight championships racing all over the US and Canada, Gregg was as versatile as he was successful. His exacting standards are obvious in the build quality of this highly modified Porsche, built to the best RSR specification of the day and continually upgraded during its long competition career more latterly with 935 parts, including suspension with desirable centrelock uprights, the gearbox installed “upside down” (to lower the C of G) and continual development of the 3.3-litre 12 plug injected engine – the final evolution prior to its retirement from international competition in the mid-eighties.